Battlefield 1 players are getting a new map in June, and it will be free to anyone who owns the Premium Pass. EA is planning to move to a schedule of monthly updates fir Battlefield 1. The May update is focusing on "Quality of life" improvements designed to make the game more "balanced and fair," but in June, we'll be getting a brand new map to play around on. The map is Nivelle Nights. The Nivelle Offensive was a large-scale combined British / French operation that took place in the spring of 1917. Although initially the operation looked successful, it resulted in so many casualties that mutinies broke out in many parts of the French Army. If you're a history buff, you can read more here on Wikipedia. 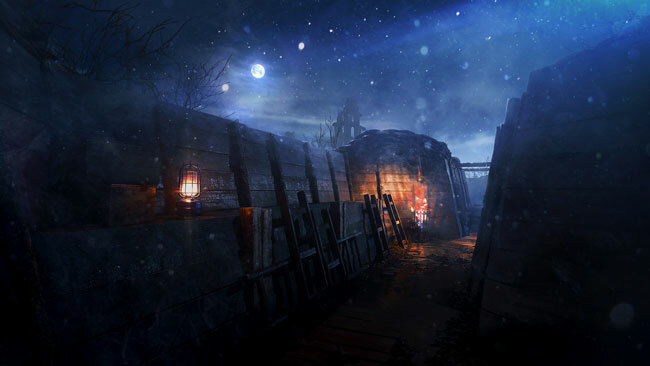 EA has only shown off one screenshot so far, showing a trenchline under a full moon. The official map description reads, "As darkness falls over the muddy battlefields around Malmaison and Soupir, French and German batteries prepare to yet again support their troops on the contested ground. The moon, the searchlights, and the artillery lights up the night skies, exposing the vast network of trenches. Bite and hold as your foe will fight for every inch of ground. Strategy and teamwork will overcome those who have neither." Once it launches in June, Nivelle Nights will be free to BF1 Premium Pass owners. There's no word yet on what the exact release date will be, or what the map will cost for those who don't own the Premium Pass.